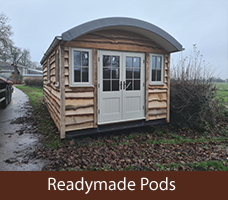 We're pleased to announce the arrival of our made-to-order straw bale 'glamping pods - perfect for glamping, offices, art studios, garden rooms - the options are endless. Get in touch today to order yours. Sam Atkinson LLP specialises in the design and construction of buildings made with natural materials such as straw bale, timber and hemp, including traditional lime rendering and clay plastering. We also design, manufacture and install high quality bespoke staircases, windows and doors a variety of miscellaneous timber products according to client specification. 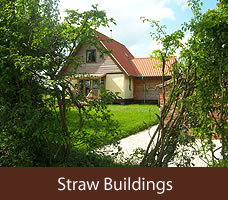 Based near Howden, East Yorkshire, our team have been involved in straw bale building since 2006. Our portfolio ranges from a small straw bale screen on a nature reserve to a straw bale family home, with a wide variety of building types in between. See our straw building page for more examples of our straw and hemp buildings. Lime or clay plasters work exceptionally well with straw bale walls because they 'breathe'. However, lime and clay based plasters also work well in many other situations where an environmentally friendly, natural finish is preferred.